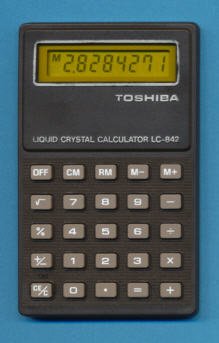 Size: 3.9" x 2.4" x 0.25"
This LC-842 looks completely different to all other known Toshiba calculators. Instead the brushed metal housing of e.g. a LC-830, it uses a plastic top mounted on a metal plate. Quality matches with the LC-8000. Dismantling the LC-842 reveals indeed a novel construction, the batteries are connected with small, conductive rubber elements instead the usual bended metal contacts. The successor of the LC-842 could be found with the odd HB-101. © Joerg Woerner, November 20, 2002. No reprints without written permission.